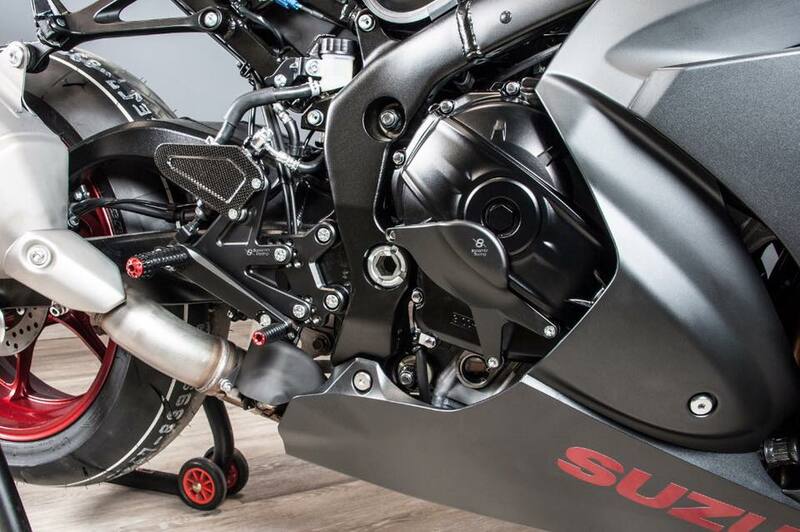 The Bonamici Racing is proud to show the accessory line in alluminum billet for the new Suzuki GSX-R 1000 2017. 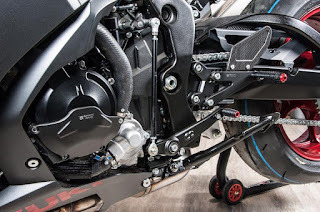 The rear sets was designed to work in normal and reverse shifting, adjustable in 9 positions, they have the lever with the use of bearings to completely eliminate the friction on the levers, a spring for the assisted return of the rear brake lever. The kit of rear sets are available in standard black colour with the possibility to have other colours or customize with racing footpeg, fold-up footpeg and frontpeg, laser engraving and other accessories. Made from Ergal billet with CNC technology, the Bonamici Racing the engine cover protections are robust and effective for save the original carter during the crash. Other accessories like block mirror, handle bars, brake and clutch levers complete the range of accessories for the last icon Suzuki.